AMD raised the bar with its Radeon R9 series and now NVIDIA responds with the GeForce GTX 780 Ti. The company's new flagship finally gives the consumer market a full GK110 GPU with all 2880 shader processors unlocked. The GTX 780 Ti not only has 192 shaders more than Titan, it also has higher clockspeeds. The core is clocked at 876MHz (837MHz on Titan) and there's a 928MHz Boost (876MHz on Titan). With 3GB GDDR5 the new card only has half the memory but with a clockspeed of 7GHz it's 1GHz speedier than Titan's. 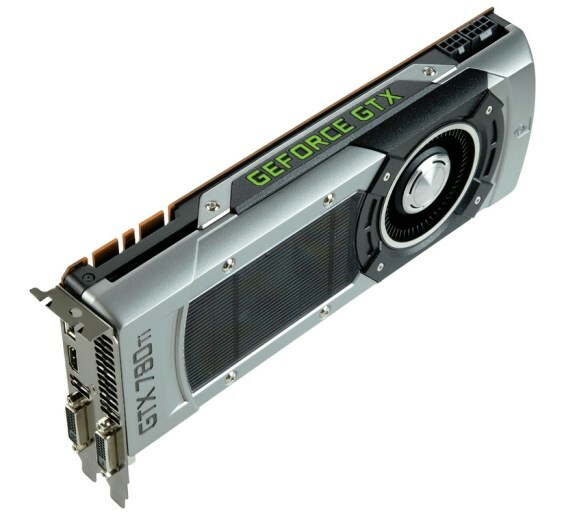 The GeForce GTX 780 Ti has a MSRP of $699 (660EUR). The reviews are out as well and they reveal the GTX 780 Ti reclaims the single-GPU performance crown for NVIDIA. However, price/performance-wise the card score significantly lower than the Radeon R9 290X, but that card has other problems like high noise output. NVIDIA today introduced the NVIDIA® GeForce® GTX™ 780 Ti GPU, which delivers incredibly smooth frame rates for gaming at extreme resolutions to this fall's hottest PC games, including Assassin's Creed IV--Black Flag, Call of Duty: Ghosts and Batman: Arkham Origins. The GTX 780 Ti also includes dedicated frame metering hardware to ensure gamers can experience the smoothest, most consistent frame delivery possible. And it supports the new NVIDIA G-SYNC™ display technology, which eliminates screen tearing, and reduces display stutter and input lag -- the bane of gamers everywhere. As cool looking as it performs, the GPU's striking industrial design includes an aluminum cover, LED-backlit GeForce GTX logo and clear polycarbonate window. "This is the way faster should be done -- cool, quiet and beautifully constructed," said Kelt Reeves, president of Falcon Northwest. "GeForce GTX 780 Ti is a GPU I can easily recommend to our clientele as the best from every aspect: speed, reliability, quietness, power consumption, build quality, driver support and value. When you add in NVIDIA's increasingly valuable ecosystem of technologies like GeForce Experience, streaming your PC games to a SHIELD handheld, and the 'must-have' G-SYNC monitors, it's obvious that NVIDIA doesn't just want to make your frame rates better, they're making PC gaming better." Several years in the making, G-SYNC technology synchronizes the monitor's refresh rate to the GPU's render rate, so images display the moment they are rendered. Scenes appear instantly. Objects are sharper and game play is smoother. The GeForce GTX 780 Ti also supports NVIDIA's latest array of advanced gaming technologies, including NVIDIA PhysX® and TXAA™. For gamers who demand the very best, NVIDIA SLI® technology -- the industry's preeminent multi-GPU solution -- scales to deliver even higher levels of performance with support for up to four-way configurations. Using the hardware encoder built into the Kepler architecture, ShadowPlay's impact on game frame rates is far lower than that of traditional recording applications, which can place great strain on the CPU. Since its beta launch a week ago, more than 200,000 GeForce owners have tried it out, uploading more than 20,000 ShadowPlay videos to YouTube alone. The NVIDIA GeForce GTX 780 Ti GPU is available now from the world's leading add-in card suppliers, including ASUS, Colorful, EVGA, Gainward, Galaxy, Gigabyte, Innovision 3D, MSI, Palit, PNY and Zotac. Partner participation will vary by region. Pricing is expected to start at $699 and for a limited time participating partners will include a free copy of Batman: Arkham Origins, Assassin's Creed IV--Black Flag and Tom Clancy's Splinter Cell: Blacklist.